in brand design language, your brand touchpoints are a complete list of every opportunity the public at large has to interact with, or “touch,” your brand, from your identity, to your marketing & advertising, to the experience of working with you. it’s a much longer list than you could probably write off the top of your head, and for that reason, it’s a good idea to compile all the possible brand touchpoints your business might have so you can give attention to each one and plan how they will work together in the grand scheme of your brand strategy. this article gives a good overview of what a brand is and defines the major common touchpoints most businesses can use to communicate their brand message. first off, all the pieces that make up your identity are also brand touchpoints [your identity is the nucleus of your brand]. building from the print matter area, add in every printed item your business produces: ads, newsletters & publications, business forms, proposals, signage & packaging, direct mail and special event collateral [if, say, you exhibit at trade shows]. these materials should all look like they’re saying what the business says it’s going to do in its mission statement to keep the message consistent each time a customer looks at your materials. what if clients look at your invoices and smile at the familiarity of someone they like working with? that’s the idea! on the less-tangible side, starting with communication devices: emails, voice mails, public speaking, networking, public relations, presentations, phone etiquette and corporate voice. how you decide to use language to reinforce the type of company you are speaks volumes in very subtle ways, and when it’s consistent from your emails to the copy on your web site to the way you and your employees interact in person, that gives your target market reliable evidence that you are who you say you are and you deliver on what you say you will. all these printed words aside, experience plays a huge role in brand communications. every time a client or customer has a chance to experience working with you is also a touchpoint. sometimes we think of this as a closed sale and forget that the experience itself is what makes them keep coming back as well as give referrals and rave reviews. aside from the communication devices listed above, a company’s approach to process and service comes in to play here. 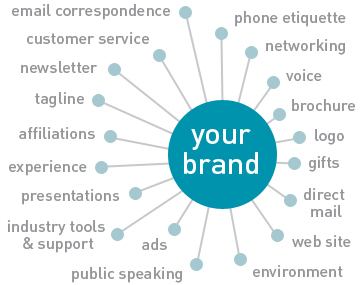 what special approach can you take that sets your brand apart from others in your field? are your employees given an internal brand launch so they have brand confidence such that they are brand merchants in the field? if you have an office or store, how does the environment work toward your brand message [and more importantly, is there anything that detracts from it that can be improved]? what are your company’s affiliations? do you use green products, associate with a favorite non-profit, work with a preferred political party or initiative? your business associations say a lot about what you’re doing behind the scenes. what is your approach to customer service? how do you create confidence and trust between your business and your clients while you’re working with them? business philosophy can inform as many tangible touchpoints as experiential—think of as many opportunities you have to do things the best way possible and implement the ones you think will make the biggest difference with your target markets. the way we get clients to smile at our invoices is by giving them a great experience. now that you have the main touchpoints in mind, the wild card category is anything that is specific to your business, your industry, or your target market. if you can create something helpful or useful as a gift to your clients, that is a great promotional touchpoint. think of your own experience in your industry: what is that one thing you’ve been doing yourself that would be so convenient if it were a form or a guide or information you could compile and share? you study your target market, you know them best, so what lifestyle choices are they making that might inform an item you could use as a promotional touchpoint? whether you create it yourself or partner with a gift company that simply puts your logo on something your clients will appreciate, the key is to make sure it’s useful and endearing to your target market so they use it, keep it and appreciate it. i can’t tell you how much swag i’ve tossed because it was a useless item that was simply an excuse to distribute a logo. think hard, choose wisely, get in the minds of your clients. better yet–ask your clients! here’s my own example: i’m a designer with a long background in print design. one way i can showcase my work while being helpful to clients is in giving them complimentary communication devices they might otherwise buy. this month, i’ve created a set of valentines for clients, friends, and anyone who will get on my contact form and request a free set. that’s right A FREE SET, request yours today so i can mail it to you in time for valentine’s day! what it comes down to is, your brand is in everything you do. leave no stone unturned, for there may be an overlooked opportunity to make a better impression. take none of them for granted, sometimes reworking the simple things to align with your brand strategy are details people notice and appreciate. if you haven’t in awhile, sit down with your mission statement and look at each touchpoint you’re currently using individually and ask yourself “how does this piece help communicate this statement?” brainstorm on it, sleep on it, think about how all of them might work together. compile a short list of sure shots and put them in action, adding any along the way that make sense. if you need ideas, advice or have questions, contact me, i’m always happy to answer! < happy st. valentine’s day 2010!